Despite not bringing anything genuinely exciting to the franchise, NBA 2K18 is one of the most popular mobile games to hit the Google Play Store late in 2017. You can read our review to learn more about the basketball sim, but full disclosure: We’re not too keen on recommending a purchase, especially if you have already plunked down money on NBA 2K17. The audio issues may be deal-breaking for some, but our biggest grumble is that the game lacks controller support, which the iOS version of NBA 2K18 offers. Or so we thought. SEE ALSO: NBA 2K18 for Android and iOS: Can your phone run it? Turns out you can use Bluetooth-enabled gamepads to play NBA 2K18 on Android devices, just like you would on iPhones and iPads. You read correctly. We tried the method below to confirm if it works. It did without any problems, on both Bluetooth controllers we own. We’re hearing positive things online from those who tried the same method, so as long as your gamepad is compatible with Android, there’s a good chance it will work. What’s more, root access is not required on your Android phone or tablet, and you do not need to reinstall NBA 2K18 or download any third-party software. All you need is the game and a Bluetooth controller, which is cheap and easy to find, in case you don’t own one yet. 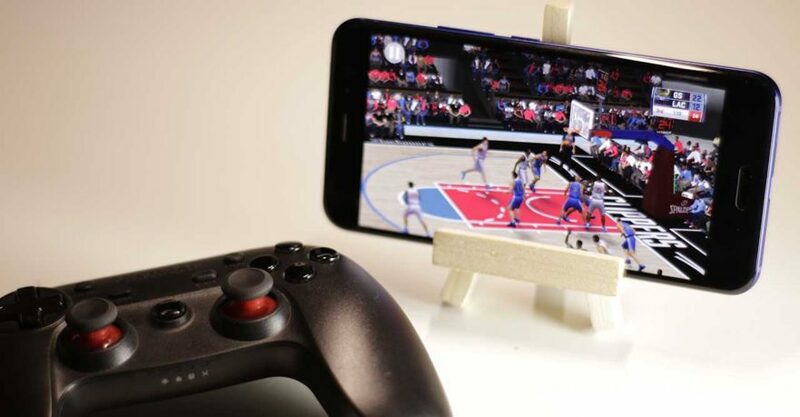 You can use Bluetooth-enabled gamepads to play NBA 2K18 on Android devices, just like you would on iPhones and iPads. Root access is not required on your phone or tablet, and you do not need to reinstall NBA 2K18 or download any third-party software. As to why the developer of NBA 2K18 chose not to include the feature in the app’s description, your guess is as good as ours. It could have something to do with the fact there’s only a small number of controllers fully compatible with iOS devices, making testing a cinch. Oh, and lest we forget, there are far fewer iPhone and iPad models than Androids in the wild. So here is how you get that gamepad to play nicely with NBA 2K18 on your Android device. Step 1. Pair the Bluetooth controller with your phone or tablet. You don’t have to repeat this step if both devices are already connected. Before proceeding, make sure the controller is recognized by Android. Step 2. Launch NBA 2K18 on your device and touch the screen to get past the title screen. Step 3. Select Quick Game by tapping the screen. Move around the left joystick to switch between Home and Away teams. You can’t use the gamepad to choose teams and uniforms; use the touchscreen instead. Step 4. Press the A or 1 button to start the match. This is important. If you accidentally use the touchscreen to proceed, you’ll have to exit the game and start all over. Step 5. Right before tip-off, move the left joystick up and down until you see an icon indicating you are in control of a player. That’s it! You should be able to use your gamepad from that point on. Do note, however, that you’ll still have to tap the screen to pause the game and select menu items. But as far as playing the game of basketball is concerned, you’re free to use physical controls and wreak havoc on the court. On a final note, there is no way to manually map the controls to your preference, though the game supports dual-analog input provided your device has two analog sticks and a direction pad. Let us know in the comments if this method worked for you or not.